Question: How do you deal with preparing for a trip? Are you a stressed packer? 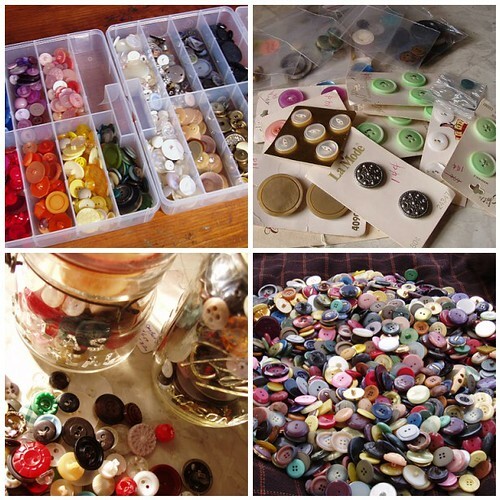 Do you run around the house trying to tie up loose ends or are you ready in advance? To knit or crochet? That is sometimes the question. For me, it’s knitting, even though I learned to crochet first. I guess it just didn’t inspire me as a 12 year old. 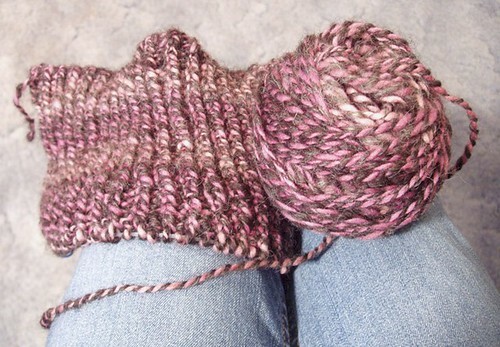 But seven years later I picked up the knitting needles and that stuck. 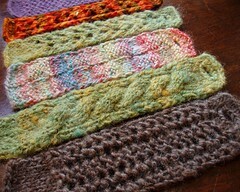 Recently I’ve tried to revisit crocheting, but it seems like my brain is too full of knitting terms and abbreviations. I just can’t remember the crochet stuff! So whenever I do decide to crochet, I just make it up as I go. Seems to work out okay. This week I attended a crocheting group at church, or rather, an introduction to crocheting. Helping other people get started is fun, but definitely a challenge. I’m always worried that I’ll teach them wrong. Or if they are struggling it’s because I didn’t explain it well. Also, I think it’s funny that everyone gets hung up on that intial sliding loopy knot thing. Haven’t even gotten started yet and things are already a mess! Oh well, it’s a journey, right? Question: Do you know how to knit and crochet? Which one did you start with? Was it more difficult to learn the second one than the first? 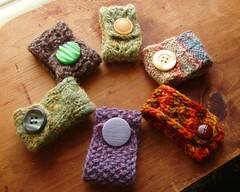 Have you ever taught someone to knit or crochet? What were the challenges? Earlier this week I mentioned a spinning group that I’ve been attending off and on for a couple years (years, really?). Out of all the different knitting circles and crafting groups I’ve wandered into, this is the only one that I continue to participate with. Once I went to my local library for a meeting and I felt very out of place. One woman actually told me, since I was a spinner, that this wasn’t the place for me (the rest of them weren’t that advanced). Another thought she had misdirected me and I should be in the Girl Scouts meeting next door. Even though the library is within walking distance, I haven’t gone back to the group. Other groups I’ve tried have been full of drama, lacked actual discussion about fiber, or been too far away. Sometimes the people are so dreary that I can’t stand to go back. Also, I find that a lot of groups meet during the day, and while this isn’t an issue now, it was a major hindrance when I was in school or working full time. Most of the time I keep to myself, but I suppose some little part of me knows I can’t be an island. 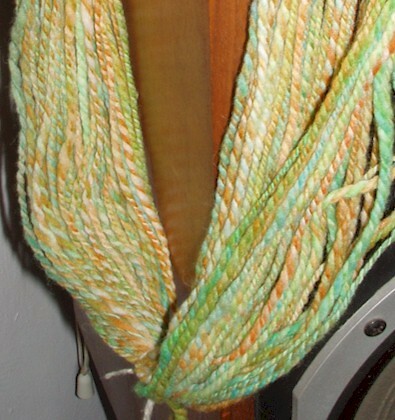 That part makes me reach out to find others who have a similar love of fiber. And sometimes I succeed. Question: Are you a social crafter? 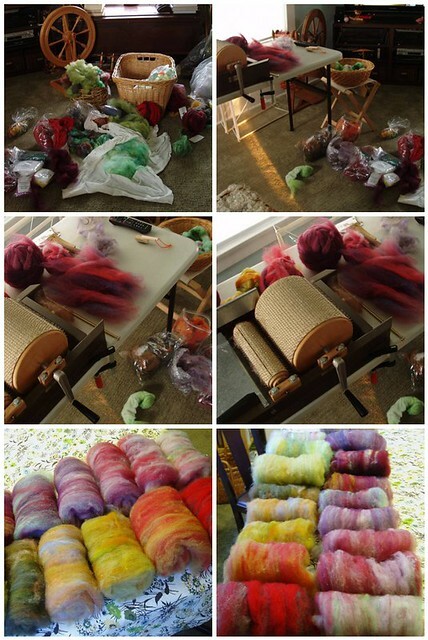 Have you ever had any negative experiences with knitting or spinning groups? What makes you return to a group? Yesterday I discovered a new spot for taking photos. It’s on the same side of the house — the south side — but the window is a little farther down. It all started with my cat wanting to sit by the window, but not wanting to sit or stand on the crates. I put her basket by the window and she finally sat in it, but she would stretch all the way across the crate to reach the basket. Later in the day I took a leaf out of the dining room table. While I was looking for a place to stash it, I realized it fit perfectly across the top of the crates. 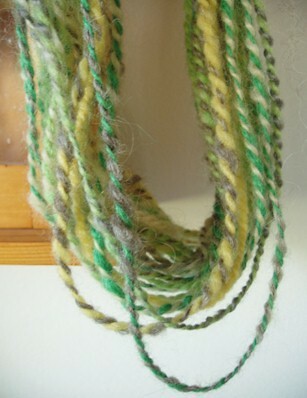 Now the cat can get to her basket and her fur won’t fall through the holes onto my yarn. But then I wanted to take a few quick photos while I was in the wool room, so I cleared a spot by the window. At first I thought the wood would be junky looking, but I think it works. And the light isn’t bad there either. Of course, it all hinges on getting it at the perfect time of day and hoping the sun is out. But I was pretty excited to find a new photo spot! I’ll have to experiment and see how the hour effects the light. The one on the left was taken in the new spot and the one on the right is at the previous spot. Which do you like better? Question: What is your photo taking process? Do you have a special spot you go to for pictures? Do you always try to use natural light? Do you adjust the pictures on the computer afterwards or do adjustments with the camera?